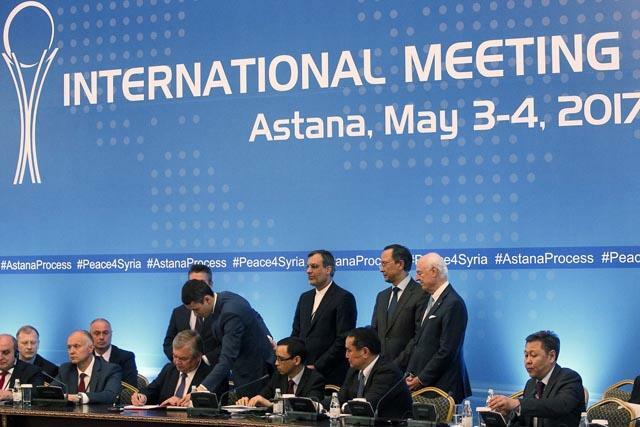 ASTANA, Kazakhstan — Syrian regime allies Russia and Iran and rebel supporter Turkey on Thursday signed a pact on a Moscow-backed plan to create safe zones in Syria meant to halt fighting in the war-torn country. The Kremlin has been touting a plan to create safe zones in Syria that is aimed at “further pacification and cessation of hostilities”. Several members of the rebel delegation, however, left the room shouting as the signing took place at talks in the Kazakh capital Astana, angry at regime ally Iran, an AFP reporter saw. The Syrian government and rebel delegations are not signatories to the agreement, which was signed by the talks’ three sponsors. Turkey’s foreign ministry said the zones would cover the whole of Idlib province, portions of the Latakia, Aleppo, Hama and Homs provinces, as well as the Ghouta suburb of Damascus. The zones will also include parts of the Daraa and Quneitra provinces, the ministry said. Moscow’s draft proposal included four safe zones. The Kremlin’s envoy at the Astana talks, Alexander Lavrentiev, said the zones were set to remain in place for six months, a period that could eventually be extended. The deal also foresees a halt in fighting in the zones, Turkey and Russia said. The Turkish foreign ministry said the zones’ parameters would be determined shortly by a working group formed by the talks’ three sponsors. “We welcome with satisfaction this memorandum, which foresees a halt in the use of all categories of arms among belligerents, including aerial weapons, as well as the rapid and uninterrupted influx of humanitarian aid towards those zones,” the ministry said in a statement. The aim of the zones, according to an Arabic version of the draft seen by AFP, is to “put an immediate end to the violence” and “provide the conditions for the safe, voluntary return of refugees” as well as the immediate delivery of relief supplies and medical aid, the document said. But issues including which countries could police any safe zones remained unclear. Lavrentiev said Moscow was ready to send observers to monitor the zones, Russian news agencies reported. The Kremlin’s plan echoes calls by US leader Donald Trump to establish safe zones in Syria. Putin said Wednesday that “as far I could tell” the US leader broadly supported the idea in a phone call they held on Tuesday. After talks with Turkey counterpart Recep Tayyip Erdogan on Wednesday, Putin said the proposed zones would also be no-fly areas if fighting on the ground there stopped entirely. Erdogan said in comments published Thursday that Moscow’s plan to set up these zones in Syria would “50 per cent” solve the six-year conflict. Although details on the plan’s implementation remain thin, Erdogan described it as a “new concept” and distinct from Ankara’s previous proposals for terror-free safe zones. If Theresa May is happy to call out anti-Semitism in other parties, isn’t it time she addressed Islamophobia in her own?